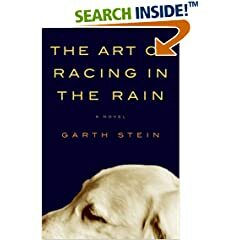 This entry was posted in Adult Fiction, Books and tagged Garth Stein, The Art of Racing in the Rain. Bookmark the permalink. I LOVE PUPPIES (by which I mean all dogs). This sounds like an interesting premise. I’ve always thought that dogs understand humans better than we do. I’m adding it to my TBR list. Pingback: Review and GIVEAWAY - The Art of Racing in the Rain by Garth Stein « Hey Lady! Whatcha Readin’? LOVED this book just finished it, had to blog about it of course. any one have any suggestions for another book? please leave the book title on my blog post on my page thanks so much!! !